Developing a health system intervention that helps to improve primary care in a low-income and middle-income country (LMIC) is a considerable challenge; finding ways to spread that intervention to other LMICs is another. The Practical Approach to Care Kit (PACK) programme is a complex health system intervention that has been developed and adopted as policy in South Africa to improve and standardise primary care delivery. We have successfully spread PACK to several other LMICs, including Botswana, Brazil, Nigeria and Ethiopia. This paper describes our experiences of localising and implementing PACK in these countries, and our evolving mentorship model of localisation that entails our unit providing mentorship support to an in-country team to ensure that the programme is tailored to local resource constraints, burden of disease and on-the-ground realities. The iterative nature of the model’s development meant that with each country experience, we could refine both the mentorship package and the programme itself with lessons from one country applied to the next—a ‘learning health system’ with global reach. While not yet formally evaluated, we appear to have created a feasible model for taking our health system intervention across more borders. Frameworks exist to guide localisation, and scale up of knowledge translation interventions focussed on specific conditions or a narrow range of clinical practices. But there is little describing how to spread comprehensive health service delivery programmes across borders to different low-income and middle-income country (LMIC) health systems. We have developed an acceptable and seemingly viable model for spreading our comprehensive clinical decision support programme, Practical Approach to Care Kit (PACK), in LMICs and have implemented it in several countries, including Botswana, Brazil, Nigeria and Ethiopia. A mentorship model to support in-country programme localisation and implementation achieved local ownership and successful piloting and is sustainable within the restricted resources of our unit. Vital for this success were regarding localisation of clinical decision support as the first step in programme implementation and drawing in key stakeholders throughout. Research and strategies14 addressing the spread of health systems interventions use various terms: ‘diffusion’ describes passive spread of an innovation, ‘dissemination’ the active and planned efforts to encourage target groups to adopt an innovation and ‘scale-up’ the widespread use among target populations.15 The latter can refer to the expansion of an intervention within one country or across borders at global scale. This paper describes our experiences of disseminating a complex health system intervention to eight LMIC settings. We do not describe the direct implementation of the intervention, but rather the approach we use to spread the intervention to other countries. As far as we are aware, there is no published literature for this “upstream” implementation. We share the challenges and lessons that have informed the development of a feasible and reproducible approach for taking our health system innovation across borders. The process of adapting the PACK programme and predecessor PALSA PLUS to other LMICs has evolved over the past 8 years. Figure 1 depicts the timeline for these localisations. Timeline for in-country PALSA PLUS and Practical Approach to Care Kit (PACK) localisations. Once success of the programme in South Africa became known through research publications and as an example of the PAL strategy,26 pulmonologists from two countries localised PALSA PLUS to their own setting independent of the KTU—Minas Gerais state, Brazil27 and Mexico. We called this approach an independent model of localisation as this work occurred without the involvement or subsequent evaluation by KTU. Separately, the KTU embarked on localisation of first the PALSA PLUS programme in Malawi28 and then PACK in Botswana.29 During both localisations, the KTU Content team led localisation of guide content and interrogation of related health systems issues (like medication and test availability), and the Training team adapted the training material, delivered the first level of training and capacitated local partners to lead the programme with ongoing KTU training lead guidance. This we called a consultancy model of localisation as it relied on our unit leading and conducting the localisation process with support from local parties. The Gambian Ministry of Health National TB Programme leads then approached the KTU to assist with localising and implementing PALSA PLUS. As we had no capacity to do so in the limited timeframe and budget, we deferred this consultancy to the programme manager from the NGO organisationwe had worked with on the Malawi localisation and implementation. Following these experiences, we were reluctant to replicate such a consultancy model, because it was too resource intensive and time-consuming to be reproducible at scale. We were also concerned that this model did not create sufficient local ownership of the programme, potentially compromising scalability and sustainability. We have since refined this mentorship model to support PACK localisations in Nigeria31 and Ethiopia,32 with some variation in response to local resources, timeframes and funding models. The features of each in-country localisation are compared in table 1. Figure 2 details a nine-step mentorship process that the KTU team (project manager and content and training team mentors) applied throughout the Brazil, Nigeria and Ethiopia localisation experiences. The steps comprise local engagement and introduction to the PACK programme, KTU mentorship of the in-country localisation of the guide, training programme and tackling of health systems issues, user testing, initial implementation and concurrent evaluation. Key to each step is an emphasis on applying the PACK principles and continuously engaging local stakeholders. Step-by-step mentorship of PACK programme localisation and initial implementation. PACK, Primary Approach of Care Kit; KTU, Knowledge Translation Unit; M&E, Monitoring and evaluation. Before embarking on the localisation work, we invested time to introduce the teams to one another and to the elements of the PACK programme and the plan for mentorship, localisation and implementation. Visits by the localising teams to South Africa occurred to allow them to experience the programme first-hand. Localising the guide, training materials and tackling health systems issues was an iterative process, with PACK Global guide content prompting interrogation of health systems issues, and clinical scenarios and health systems realities and priorities altering guide content. This made stakeholder input vital and end-user testing a key step. In Nigeria, for example, a questionnaire and consultation log that required end-users to work off priority guide pages, like ‘cough and difficulty breathing’ and ‘HIV’ helped to identify gaps and errors. We borrowed agile development concepts from the information technology industry33 to make tackling comprehensive content more manageable. We divided guide content into sections for localisation, provided attentive project management and regarded the localised guide as ‘Version 1’ which allowed the teams to park lower priority content (like hair loss in Ethiopia) for future editions in order to maintain momentum of localisation and stakeholder engagement. Thus far, the KTU has managed the artwork of the guide and most training materials. As some of the PACK guide’s appeal is its design—full colour, carefully formatted algorithms and checklists, illustrations and photographs—design expertise and expensive graphic artwork programmes are needed to maintain its high quality. Localising teams have had neither the capacity nor resources to perform this function. It has also enabled the KTU content mentor to have ‘sign-off’ of all guide content. At the outset, the in-country localising team received a PACK Manual for Localisation and Implementation with an accompanying Toolkit. The manual conveys PACK principles and gives step-by-step guidance for the localisation process. The toolkit contains the components of the programme—the PACK guide, lists of medication, equipment and tests and training materials—as well as the tools used for localisation and implementation: localisation schedule, evidence and decision support document for guide localisation (with references underpinning each guide recommendation), editable templates of guide and training programme and materials and printing specifications. Each of the Brazil, Nigeria and Ethiopia PACK localisation mentorship experiences met challenges along the way. Except in Brazil where the localising team lead was relieved of other responsibilities, members of the localising teams had to fit PACK between ongoing work commitments. The Ethiopia team addressed this by convening 2-week intensive localisation workshops for local clinical experts who then took time out from their usual responsibilities; the Nigeria team scheduled regular late-afternoon meetings after the work day was done. Regular communication between the KTU mentors and localising teams in Nigeria and Ethiopia was often frustrated by poor internet and telephone connectivity. In Brazil, the language difference occasionally made communication difficult but was especially apparent in localising guide content where Brazilian Portuguese required more space than the English equivalent, necessitating careful editing. At times, localising teams lost sight of the PACK principles, attempting to add more content to the guide (overwhelming in both volume and layout) or speed up the delivery (which can undermine efforts to embed the programme into practice). Team visits helped to mitigate this, clarifying the principles when pages were workshopped together and localising teams experienced PACK in action during on-site training. PACK localisation is time intensive, requiring detailed attention from both teams. However, the costs of this work are often beyond government budgets, and local regulatory constraints make it difficult for governments to contract with and transfer funds to external organisations like the KTU and BMJ that do not have in-country operating entities. As a result, PACK localisations usually occur with minimal funding and extensive in-kind support from KTU, BMJ and localising partners. Thus, early implementation is slow and small, making it difficult to demonstrate the level of embeddedness in the health system and definitive positive outcomes to justify further roll-out. This is an experience not unique to PACK,6 but it has placed severe financial pressure on the soft-funded KTU. Localisation and implementation were interrupted or slowed by country-wide political instability (Malawi, Brazil) and changes in health organisation structuring and leadership (Nigeria, Brazil, Ethiopia). This argues the case for acquiring both high level and on-the-ground buy-in for the programme that can then weather fluctuating political environments—demonstrated by PACK’s survival in Florianópolis, Brazil. From our experience of supporting the localisation of PACK in a variety of LMIC settings, we have learnt lessons about both the localisation process and the mentorship of that process. A mentorship approach to localisation appears to be a good and viable model. All three countries completed localisation successfully, Brazil and Nigeria have completed pilot implementation with plans for expansion and Ethiopia is set to embark on nationwide roll-out. Mentorship ensured quality assurance and adherence to the PACK principles. However, the process must be flexible, with each localisation adjusting the model as required: Brazil repackaged the modularised PACK training programme as ongoing sessions that focused on participant need, to expedite completion, Ethiopia conducted intensive localisation workshops rather than sticking to the PACK 4-month schedule and Nigeria is adding paediatric content in the Adult guide during its 2018 update. Although both PAL35 and mhGAP36 implementation frameworks advise gaining high level government buy-in as a first step, in our experience, this has been difficult to achieve from the outset, and only once a pilot has showcased the programme and its potential has it generated national level interest. Shifting the perspective that localisation is a separate, preimplementation activity to one that is integral to implementation has both facilitated localisation and achieved stakeholder support. The Nigeria localisation saw the interrogation of policies, update of medicines lists, equipment and test availability and adjustments to scope of practice and referral pathways occurring in parallel with stakeholder engagement sessions, end-user testing and facility readiness preparations which meant the guide was completed in time and its uptake enthusiastic in pilot states. Localisation prompted the development of setting-specific content for example, Chikungunya in Brazil, sickle cell anaemia in Nigeria. As these conditions are regional issues, we chose not to include them in the global guide and toolkit update but might draw on them if needed. However, some local changes were generic enough to be absorbed into the global update and then implemented in other localisations like tobacco cessation from Brazil and an expansion of palliative care guidance from Ethiopia, depicted in figure 3. Applying learnings from one localisation to the next. In addition to content innovations, there were instances where enhancements to the localisation process were then absorbed into the mentorship of other countries. Brazil introduced a project management app that has since supported each localisation and also identified the need to clearly explain the training approach, prompting expansion of the toolkit to include videos explaining the features and principles of the guide and training. Face-to-face visits, while costly, have been vital to building KTU-localising team relationships. The visits provided the opportunity to workshop challenging localisation issues together and facilitated localising team participation in PACK training—experiencing the programme in action helped to adjust implementation plans and facilitated high fidelity to PACK principles. We have decided to focus initial PACK expansion efforts on large LMICs in different regions of the world. This might allow us to recoup some of the investment in upfront localisation and piloting through wider in-country applicability and see whether emerging similarities hold true across diverse environments. Ultimately, we envisage PACK regional technical support hubs—for example, the Brazil team supporting Latin American localisations, Nigeria supporting West African. We shall prioritise LMICs over high-income countries, although recognise the potential of PACK in that setting37 given the need for cost reduction and inequalties in healthcare. PACK continues to be spread with support from the KTU using an ever-evolving mentorship approach. The Peking University Family Medicine department has embarked on PACK localisation in China. Funding constraints and language barriers might limit mentorship, allowing us to examine successes and challenges of a relatively unsupported localisation and to enhance the PACK Localisation Manual and Toolkit. The PACK programme receives interest from leaders in both PACK-implementing and PACK-interested countries, global health leaders, academic institutions, technical advisory organisations and healthcare providers and funders. The KTU and BMJ are launching a “PACK Global Movement” of PACK implementers and advocates that share experiences from PACK implementations and collaborate on evaluation activities. The movement could also create the impetus to achieve ongoing funding to sustain global and in-country PACK activities. In 2017, the KTU supported the update of the PACK guide and training materials in Brazil and is currently mentoring the update and upscale of the programme in Nigeria (see the timeline in figure 1). Future work will include finalising a manual, toolkit and mentorship package for the update, upscale and sustaining of the programme in-country. This practice paper is a description of the PACK localisation experiences, not a formal evaluation of the PACK approach to spread. We plan to formally evaluate how best to localise PACK in an effective way that ultimately needs minimal external support. First, using key role-player interviews, we need to deepen our understanding of the localisation experiences thus far, whether through an independent, consultancy or mentorship model. Evaluations of future localisations could include qualitative comparative case studies and pragmatic trials to examine outcomes like quality of guide localisation, effectiveness of the implementation strategy, acceptability of the programme among policymakers and health workers, its scalability and sustainability, and ultimately impact on quality of care. We also need to develop and evaluate different approaches for maintenance and in-country scale up, as local programmes mature. Such evaluations would contribute to the literature on localising and disseminating health systems interventions to LMIC settings. The PACK localisation experience, though still in its infancy, has thus far been successful in several LMICs. Crucial throughout has been balancing the PACK principles with a degree of local reinvention, addressing health system strengthening and involving local stakeholders. Ultimately, PACK has been championed by local clinicians with an understanding of and a strong vision for integrated primary care. Using a mentorship model to support in-country localisation has been feasible within the limited resources of our team and allowed for the iterative improvement of both the model and the PACK programme from one localisation experience to the next—a learning health system38 with global reach. The lessons that have emerged have helped to craft a viable model for taking PACK to other countries that now requires formal evaluation to test for its effectiveness and reproducibility across borders. Such evaluations could also contribute to an understanding of how different models for spreading health systems innovations work. We acknowledge all those who supported and conducted localisations of PACK, in particular, Matheus De Andrade and Ronaldo Zonta who led the Brazil localisation, Joseph Ana who led the Nigeria localisation and Yibeltal Mekonnen who led the Ethiopia localisation. We acknowledge the in-kind contribution from the Health Department of the Municipality of Florianopolis for the PACK Brazil localisation. Primary Health Care Performance Initiative, 2018. Promising practices’ website. Available from: https://phcperformanceinitiative.org/tools/promising-practices [accessed Jul 2018]. , 2018. Maternal, newborn, child and adolescent health. Available from: http://www.who.int/maternal_child_adolescent/topics/child/imci/en/ [accessed Jul 2018]. World Health Organisation, 2018. Practical Approach to Lung Health (PAL). Available from: http://www.who.int/tb/health_systems/pal/en/ [accessed Jun 2018]. World Health Organisation, 2010. Nine steps for developing a scaling-up strategy. Available from: http://www.who.int/immunization/hpv/deliver/nine_steps_for_developing_a_scalingup_strategy_who_2010.pdf [accessed June 2018].
. Translating knowledge into practice: core principles of the Practical Approach to Care Kit. To be submitted to BMJ Global Health as part of the PACK Collection.
. 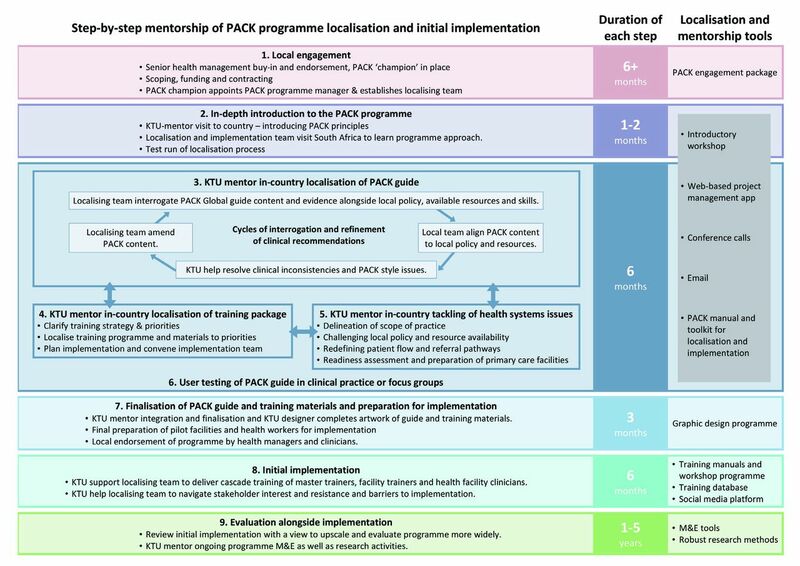 The Practical Approach to Care Kit (PACK) training programme - scaling up and sustaining support for health workers to improve primary care. BMJ Global Health 2018;In press. doi: 10.1136/bmjgh-2018-001124. , 2018. Global Alliance against Chronic Respiratory Disease website – Demonstration project. Available from: http://www.who.int/gard/countries/demonstration_project_south_africa/en/ [accessed Jun 2018].
. Using a mentorship model to localise the Practical Approach to Care Kit (PACK): from South Africa to Brazil. BMJ Glob Health 2018. In press: doi: 10.1136/bmjgh-2018-001016.
. Using a mentorship model to localise the Practical Approach to Care Kit (PACK): from South Africa to Ethiopia. BMJ Glob Health 2018. In press: doi: 10.1136/bmjgh-2018-001108.
. Final Report on PACK Nigeria Adult Pilot Version 1.2. 26 October 2017 2017.
. Practical Approach to Lung Health Manual on Initiating PAL Implementation. Geneva: World Health Organization, 2008.
, 2018. World Health Organisation Health Situation Analysis The Gambia webpage. Available from: http://www.aho.afro.who.int/profiles_information/index.php/Gambia:Analytical_summary_-_Tuberculosis [accessed May 2018]. Contributors RC wrote the first draft of the paper. All authors contributed intellectual content, edited the manuscript and approved the final version for submission. Funding The KTU has received funding from various sources for PALSA PLUS and PACK localisation support work. The International Development Research Centre (IDRC) and Canadian International Development Agency (CIDA) funded work in Malawi and the Medical Education Partnership Initiative (MEPI) supported the PACK Botswana localisation, specifically funded by US’ HRSA (Health Resources & Services Administration). The PACK Nigeria pilot was funded through the Nigerian State Health Investment Project (NSHIP), a World Bank-assisted initiative led by Nigeria's National Primary Health Care Development Agency. The localisation of the PACK Nigeria guide and training resources was funded through a central NSHIP technical assistance budget managed by Oxford Policy Management. The KTU mentorship of the Ethiopian localisation work was supported by the United Kingdom’s National Institute of Health Research (NIHR) using Official Development Assistance (ODA) funding (NIHR Global Health Research Unit on Health System Strengthening in Sub-Saharan Africa, King's College London (16/136/54)). The KTU received funding to support the development of the PACK localisation package from the Peter Sowerby Charitable Foundation. Additional funding was provided by the BMJ Publishing Group and University of Cape Town Lung Institute. Tanya Doherty’s time was supported by the South African Medical Research Council. PACK receives no funding from the pharmaceutical industry. Disclaimer The views expressed in this publication are those of the author(s) and not necessarily those of the NHS, the National Institute for Health Research or the English Department of Health. Competing interests We have read and understood BMJ policy on declaration of interests and declare that RC, CW, AA, CR, LA, EB and LF are employees of the KTU. T Eastman is a contractor for both KTU and BMJ, London, UK. JZ is an ex-employee of the City Health Department, Florianópolis, Brazil and a current holder of full-time PhD studentship from the Brazilian research agency CNPq. MZ is an employee of the Centre for Studies in Family Medicine, Schulich School of Medicine & Dentistry, Western University, London, Ontario, Canada. TD is an employee of the South African Medical Research Council. EB reports personal fees from ICON, Novartis, Cipla, Vectura, Cipla, Menarini, ALK, ICON, Sanofi Regeneron, Boehringer Ingelheim and AstraZeneca, and grants for clinical trials from Novartis, Boehringer Ingelheim, Merck, Takeda, GlaxoSmithKline, Hoffmann le Roche, Actelion, Chiesi, Sanofi-Aventis, Cephalon, TEVA and AstraZeneca. All of EB’s fees and clinical trials are for work outside the submitted work. EB is also a Member of Global Initiative for Asthma Board and Science Committee. Since August 2015 the KTU and BMJ have been engaged in a non-profit strategic partnership to provide continuous evidence updates for PACK, expand PACK related supported services to countries and organisations as requested, and where appropriate license PACK content. The KTU and BMJ co-fund core positions, including a PACK Global Development Director, and receive no profits from the partnership. PACK receives no funding from the pharmaceutical industry. This paper forms part of a Collection on PACK sponsored by the BMJ to profile the contribution of PACK across several countries towards the realisation of comprehensive primary health care as envisaged in the Declaration of Alma Ata, during its 40th anniversary.